We are very pleased to announce that our 20-page booklet, Pushed and Consented: Rights in Childbirth?, is available for purchase on the Birth Rights Bar Association website. Click the cover image to go straight there! 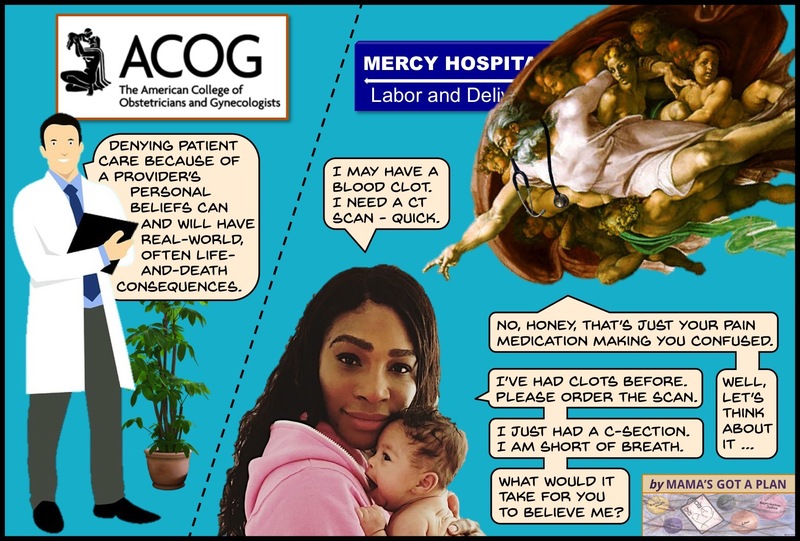 Cartoons with explanatory text address the question mark in the title and lay out the current legal landscape. Buy your copy today! If you would rather view the booklet online, it is available at this link. BRBA suggests making a donation if you choose view the booklet online. Categories: law, maternity care, reproductive justice | Tags: cartoons | Permalink. This is the final installment in the story of Michigan’s nine-year journey toward a law to license Certified Professional Midwives. The story begins HERE. The entire series can be accessed HERE. 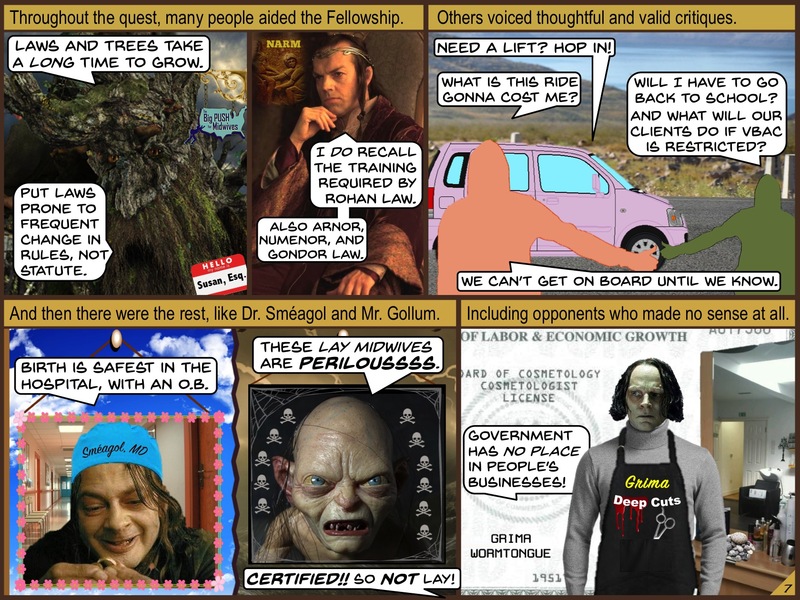 The Senate floor and House concurrence votes would have been a more striking triumph if more of the Fellowship had been awake for them (Frame 1). 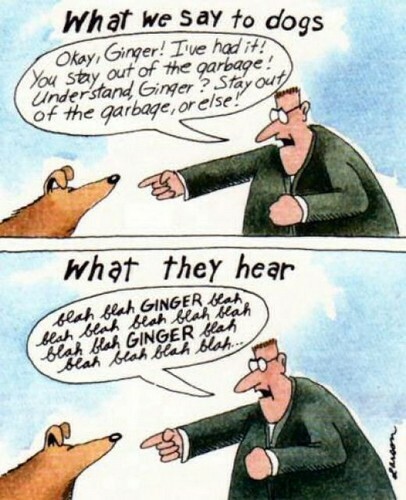 Eowyn’s thought bubble is an oblique tribute to this famous Far Side cartoon. The Quest stands upon the edge of a knife. Stray but a little, and it will fail, to the ruin of all. Yet hope remains while the Company is true. Sing it, Sister! Also, “Governor Galadriel” has a nice ring to it. The time span between the passage of the bill and the Governor’s signature seemed endless (Frame 3). 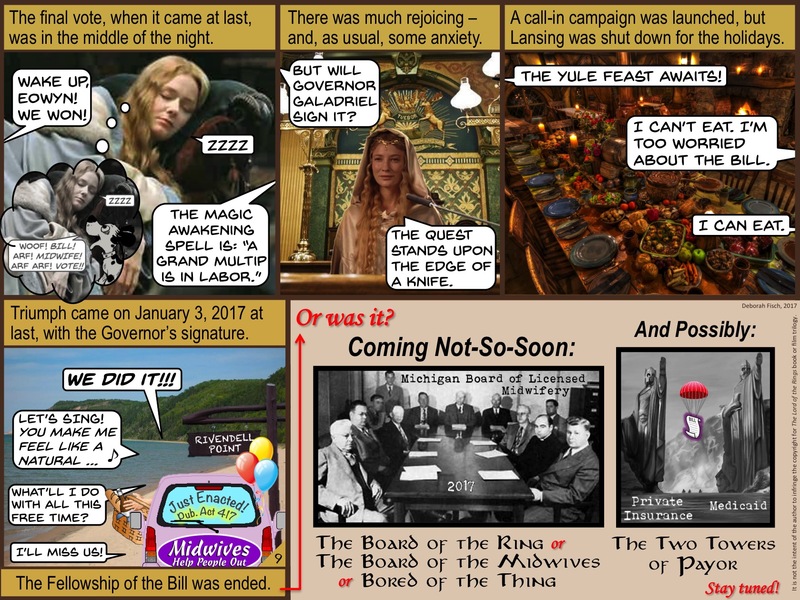 The Yule feast pictured in Frame 4 is not only an outright invention, but casually borrowed from a tour of New Zealand Lord of the Rings filming locations. In return, we suggest you check out tours at MikeTheGuide.com and make a point of stopping at the Green Dragon Inn near the Hobbiton Movie Set. The Governor finally signed the bill early in 2017, a cause for great celebration (Frame 4). If you know anything about Michigan, you’ll appreciate the celebration did not take place shortly following the signing, but much later in the year on another equally beautiful – and much warmer – Lake Michigan beach. 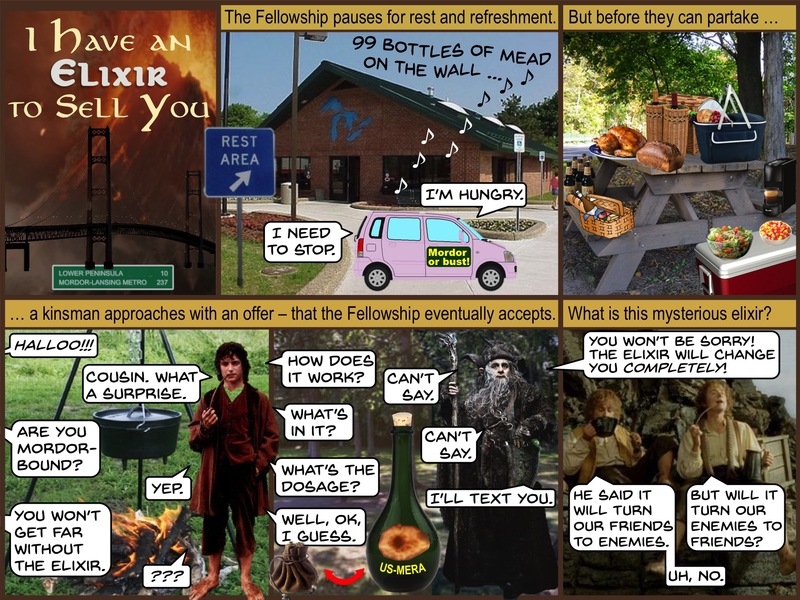 Is this successful enactment of the bill the end of the Fellowship? Probably not. A portion of its membership is ensconced on the new state Board of Licensed Midwifery – portrayed here by a photo of a 1949 committee of the Florida State Prison system. A future effort to guarantee Medicaid coverage for Licensed Midwife care has also not been ruled out. For the meantime, the Fellowship is returned to its daily routines. Babies are born. Parents are created. Midwives are credentialed. Life goes on. This is the continuing story of Michigan’s nine-year journey toward a law to license Certified Professional Midwives. The first installment of the story is HERE. 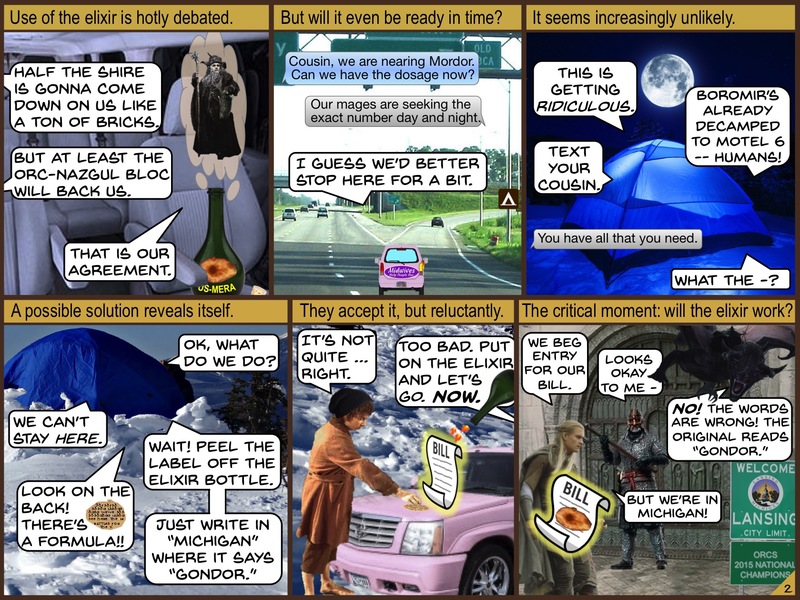 While Michigan was toiling towards Mordor, other states continued to enact CPM licensure measures (Frame 1). The big surprise of 2013 was Indiana, a highly punitive state whose midwives had long been forced underground. Rhode Island regularized its midwives’ legal status in 2014, followed by Maryland in 2015. In 2016, Maine became the 30th state to license CPMs. The licensure acts just listed were evaluated by the Fellowship with mixed results, but the chief worry was that Michigan would be the very last state to pass such a measure. 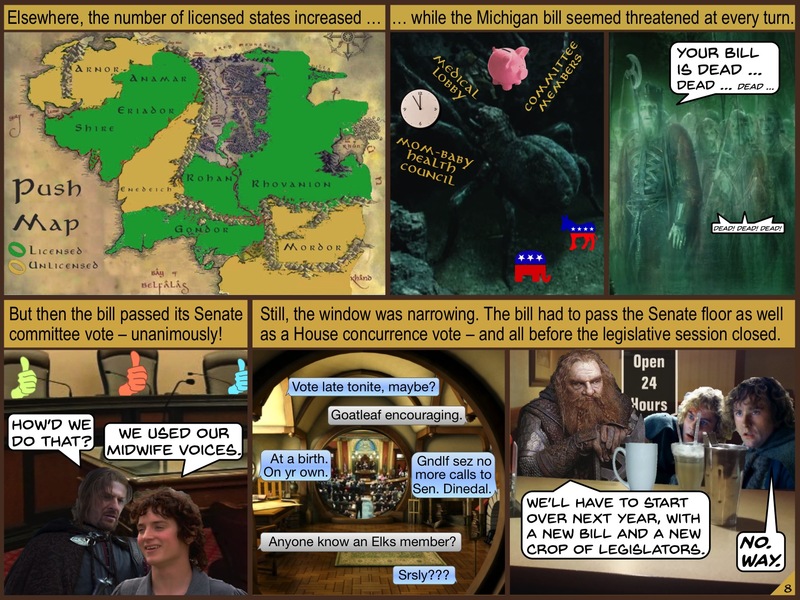 Like the many-limbed Shelob, numerous entities and factors continued to threaten the Michigan bill (Frame 2). The medical lobby was joined in its opposition by the primary Michigan maternal and child health organization. Each Senate committee member had to be laboriously courted. Both majority and minority parties displayed their foibles, and the Fellowship hardly dared to shake its piggy bank. But the primary foe was time. Fellowship members regularly heard nightmare voices proclaiming the death of the bill. After some heavy-duty compromising, the Fellowship was pleased to see its hard work pay off. 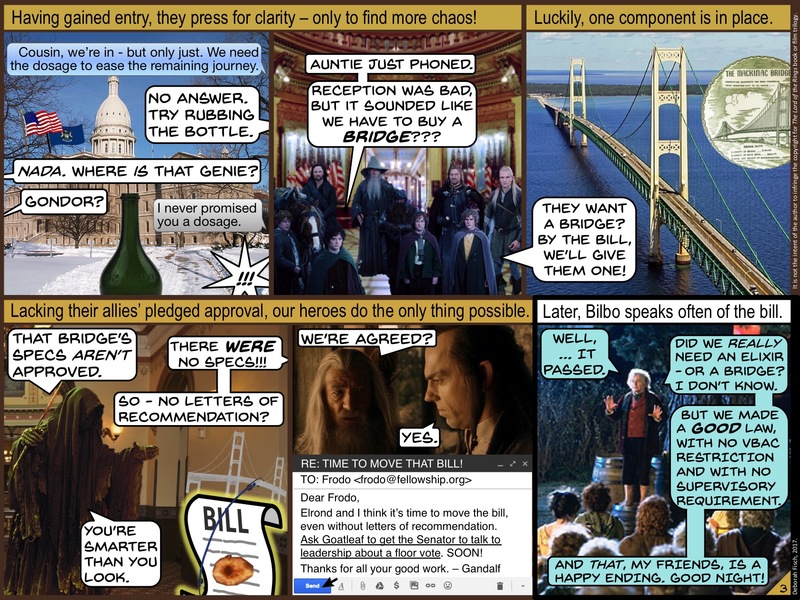 When the bill passed out of Senate committee, it nevertheless felt like a miracle (Frame 3). Boromir, not being a midwife herself, developed a belief in the persuasive power of the “Midwife Voice.” At any rate, that’s how she explained the vote – and her own surprised willingness to take on tasks following Fellowship meetings. It was late 2016. The legislative session was anticipated to end at an unnamed December date. Would the bill receive a Senate floor vote? Texts once again flew back and forth (Frame 4) between Fellowship members, Gandalf, Senate staffers, and anyone whose opinion might carry weight with Senate leadership. A failure would mean beginning all over again the following session, a prospect that filled the Fellowship – and its empty pockets – with dread. Many others assisted the Coalition. The Big Push (see Page 1) was particularly helpful with both collective wisdom from other states and specific strategy and legal knowledge from Susan Jenkins, Big Push steering committee member and legal advisor (Frame 1). Likewise, Ida Darragh of NARM (North American Registry of Midwives) seemed to hold every licensed state’s education and training requirements in her head (Frame 2). Other direct entry midwives were generous with their advice and questions (Frame 3). 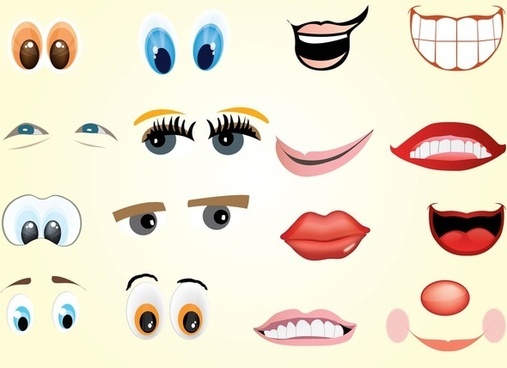 On the other hand, certain factions promised to oppose the bill no matter what, including a notorious national troll who had for years attacked midwives, home birth, physiological birth – anything that deviated from the standard medical model of care (Frames 4 and 5). Like many Jekyll-and-Hyde pontificators – or, in this case, Sméagol-and-Gollum ones – this troll typically appears with a wish to protect the safety of mothers and babies that quickly metamorphoses into vicious diatribes against midwives. The ultimate wild card, however, was a local health care provider who opposed the CPM bill on the principle that licensure constituted government interference. She herself, of course, was licensed by the state (Frame 6). She is represented here as a hairdresser, to spare her real profession from embarrassment. The pile of Petoskey Stones behind her is included as Michigan Content.